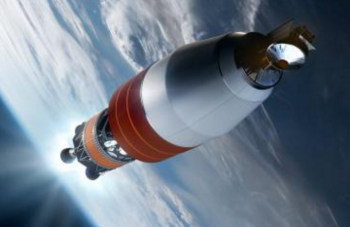 After years without concrete missions beyond the current EM-2 test flight, NASA has finally unveiled a plan for multiple missions of its SLS rocket. 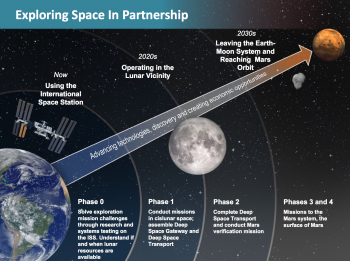 The plan would see NASA initiate a multi-step approach to human exploration in cislunar space while simultaneously developing the architecture to enable human missions to Mars – all of which is dependant on funding from the U.S. Congress, which is currently seeking deep cuts to U.S. government spending. 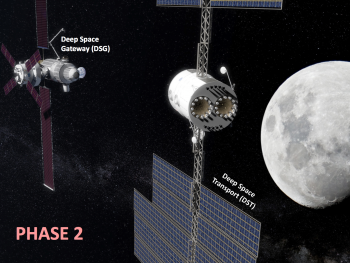 As part of the agency’s standard updates to the NASA Advisory Council (NAC), Bill Gerstenmaier, Associate Administrator for NASA’s Human Exploration and Operations Mission Directorate (HEOMD), has presented the NAC with the agency’s Deep Space Gateway and Transport Plan. Now, however, the Deep Space Gateway and Transport plan relates directly to the NASA Transition Authorization Act of 2017. To fulfill the goals set forth in the NASA Transition Authorization Act of 2017, the HEOMD is operating on a refined five phase plan stretching from “now” to the “2030s”. The first phase, Phase 0, involves the current utilization of the International Space Station. 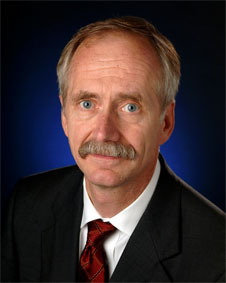 For the lunar resources aspect, Mr. Gerstenmaier stated to the NAC, “We’ve talked about Lunar Resource Prospector. We’ve talked about some way of going to the surface of the moon in the regions that are potentially volatile rich. 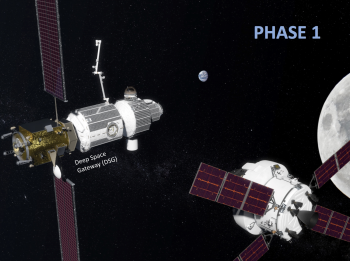 Following Phase 0, Phase 1 in the 2020s will see NASA undertake missions to cislunar space for construction efforts of the agency’s new Deep Space Gateway (DSG). Phase 2 will see construction of the Deep Space Transport (DST) and its subsequent shakedown and verification. Presumably, the “Mars system” language refers to previously notional missions to one of Mars’ two moons – Phobos or Deimos – before committing to human landings on the surface of the Red Planet. Of the five phase approach, the HEOMD presentation to the NAC went into specific detail about Phases 1 and 2 of the plan. Specifically, the DSG will be designed for deep space environments to support a “crew of 4 for total missions up to 42 days” as long as Orion is docked to the DSG. 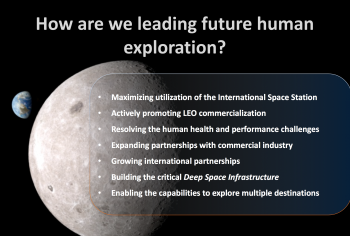 Moreover, according to Mr. Gerstenmaier, “The purpose of this Deep Space Gateway is that it can support activities towards the surface of the moon. It could be a transportation node to the surface of the moon. It can also be maneuvered into a high elliptical lunar orbit, a rectilinear orbit around the moon. Under the Phase 1 plan, NASA would utilize its SLS rocket for four dedicated DSG construction missions. Notably, this provides the first concrete representation of SLS’s potential missions beyond the currently planned EM-2 flight. 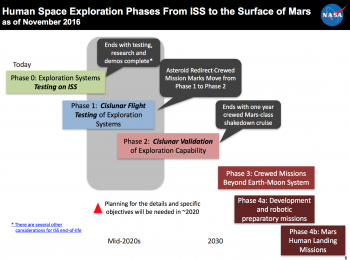 Overall, though, the Phase 1 plan includes six SLS flights. The first SLS mission, EM-1, according to the HEOMD 28 March 2017 presentation, shows an uncrewed EM-1 mission launching on an SLS Block 1 vehicle in 2018. This EM-1 mission would be a 26-40 day mission to a Distant Retrograde Orbit around the moon. Interestingly, this is a significantly longer EM-1 mission than previously discussed by NASA – which had until now showed EM-1 as a No Longer Than three week flight. Importantly, this description of an uncrewed EM-1 flight should not be read as any indication from NASA that their study into flying EM-1 as a crewed flight is off the table. Bill Gerstenmaier noted specifically to the NAC that NASA’s teams are still investigating a crewed EM-1 flight and that no decision had been reached at this point. EM-1, under the Phase 1 plan, would then be followed in the 2022-ish timeframe by the first flight of the SLS 1B Cargo vehicle. 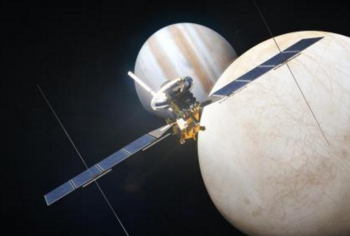 This flight would be used to launch NASA’s Europa Clipper mission on a direct trajectory flight to Jupiter. This would afford NASA the opportunity to both demonstrate the SLS’s cargo launch ability for outer solar system robotic exploration missions and to verify the Exploration Upper Stage (EUS) in flight prior to flying a crewed mission using the EUS. Curiously, the HEOMD presentation lists the Europa Clipper launch on SLS as “subject to approval”, and Mr. Gerstenmaier talked somewhat extensively about the other launch option available. This is highly suspect given Congress’ mandate via legislation (essentially, Congress has made it the law) that Europa Clipper’s launch be on an SLS rocket. Regardless, after the SLS Europa Clipper mission in 2022, the next four years would see one SLS crewed flight per year. 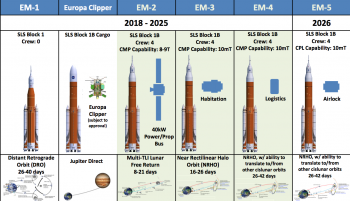 The first, called EM-2 in the plan (a viewpoint into how the new SLS manifest will shake out in terms of what EM-2 might now look like), will see SLS and a four person crew launch on an 8-21 day “Multi-TLI Lunar Free Return” mission to deliver the first element of the DSG to cis-lunar space. The DSG component is slated to be the 8-9 metric tonne (mT) Power and Propulsion Bus – of the same design as the one that would have been used on the now-defunct Asteroid Robotic Redirect Mission – capable of generating 40 kW of power. The Power and Propulsion Bus will also have 12kW thrusters for maneuverability and will also have chemical propulsion capability as well, noted Mr. Gerstenmaier. Importantly, Mr. Gerstenmaier noted that Orion and the 4-person crew of EM-2 would not dock to this power bus. This EM-2 mission would be followed in 2024 by EM-3 – a 4 person flight to deliver the ≤10 mT Habitation module to the DSG – which at this point would have maneuvered into a Near Rectilinear Halo Orbit (NRHO). EM-3 would last between 16 and 26 days and would be the first flight capable of performing scientific objectives on the DSG. This mission would be followed by a commercially-contracted Cislunar Support Flight (CSF). “[The Deep Space Gateway] doesn’t preclude the commercial industries or using their vehicles to take significant logistics to this gateway,” noted Mr. Gerstenmaier. The EM-4 mission would then follow in 2025 with a 4 person crew to add a ≤10mT Logistic module (which will include a Canadian-built robotic arm) to the DSG. 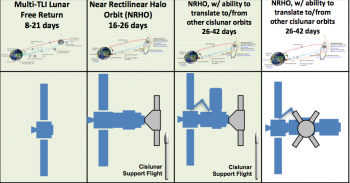 At this point, the DSG could support a 4-person crew for up to 42 days and would have the ability to “translate to/from other cislunar orbits” from its NRHO. EM-4 would be followed by another commercially-contracted CSF before the final Phase 1 flight in 2026 of the EM-5 mission to deliver the ≤10mT airlock to the DSG. 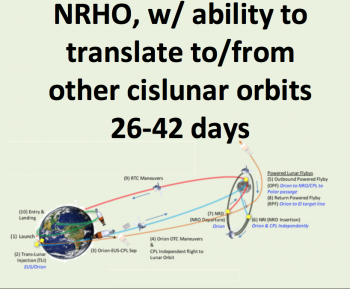 As with EM-4, EM-5 would last between 26-42 days and would have the ability to translate between cislunar orbits. According to Mr. Gerstenmaier, these EM-4 and EM-5 extended missions would replace the crewed Asteroid Redirect mission, with the goals of longer-duration cislunar flights shifting to these DSG missions. Moreover, the Japan Aerospace and eXploration Agency (JAXA) has expressed interest in adding a further module to the DSG, noted Mr. Gerstenmaier. Phase 2 would begin in 2027 via a series of three flights – starting with a commercially-contracted CSF mission. After this, 2027 would see two SLS flights. The first SLS mission would be an uncrewed cargo flight, called EM-6 (confirming that uncrewed SLS missions can received an “EM” flight designation), to deliver the ≤41t Deep Space Transport (DST) into cislunar space. The DST would be docked remotely to the DSG. Under the Phase 2 plan, EM-6 would be followed later in 2027 by a 4 person crewed SLS flight, EM-7, on a logistics module run to the DSG/DST. 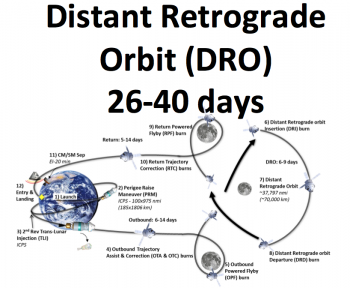 In addition to bringing logistics to the DSG/DST, the EM-7 crew would also perform a 191-221 day NRHO checkout mission of the DST (while the DST remains docked to the DSG). 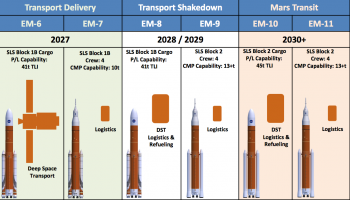 In 2028, another commercially-contracted CSF mission would occur before the EM-8 mission – an uncrewed DST logistics and refueling flight of the SLS Block 1B cargo vehicle. Notably, EM-8 is listed as the last flight of the SLS Block 1B design. 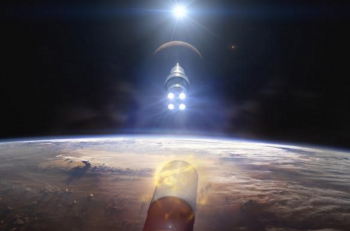 The following year, 2029, would see the introduction of the SLS Block 2 variant – with advanced side-mounted boosters. This first Block 2 flight would be the EM-9 mission, a crewed flight with 4 astronauts. EM-9 would see the 4 person crew rendezvous with the docked DSG/DST spacecraft and perform at 300-400 day DST shakedown mission in cislunar space. Furthermore, the goal of the one-year shakedown is to operate as if it were a three year mission to Mars by placing all of the logistics, all of the supplies, all of the spares on the vehicle and simulating – as safely as possible – the habitat and crew’s ability to function without a direct rocket supply line to Earth. Ultimately, though, this shakedown will have the ability to terminate quickly should the need arise. Right now, the plan for this year-long mission would be to keep the DST docked with the DGS, though Mr. Gerstenmaier did note that there is an option to undock the DST to perform a solo year-long shakedown cruise. At this point, according to the HEOMD presentation and Mr. Gerstenmaier, the stage would be set for the agency’s first human flight to Mars. 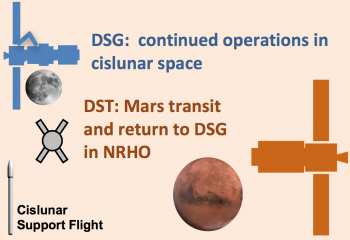 A commercial CSF flight would then kick off NASA’s Mars campaign ahead of a “2030+” timeframe launch of the EM-10 mission, a Block 2 SLS cargo run to DSG/DST for logistics and refueling. This would be followed in the same general “2030+” timeframe by EM-11. The EM-11 crew would board the DST, undock it from the DSG, and take the DST on a Mars transit mission. 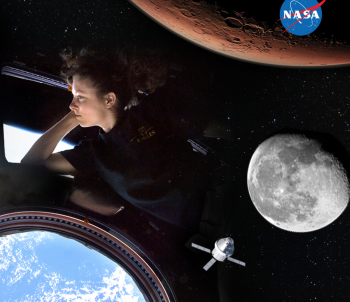 Overall, NASA envisions the DST as capable of supporting a 4-person crew on a 1,000 day mission to Mars. Moreover, the DST would be used for three Mars-class missions before needing to be replaced. A forward plan, but what about funding? As with all federal agencies, bringing this plan to fruition is entirely dependent on the materialization of funding from the U.S. Congress. Currently, the U.S. government will run out of money at the end of the day on 28 April 2017 unless Congress can pass and the White House sign a complete or temporary spending bill. Moreover, while the stated goals of the Deep Space Gateway and Transport Plan are certainly ambitious and hold the potential to see NASA realize and utilize the SLS rocket and its capabilities, the U.S. Congress as well as the White House are currently seeking deep cuts to U.S. federal spending. Despite promising words from President Trump when he signed the NASA Transition Authorization Act of 2017 last month, it remains to be seen exactly what NASA’s spending priorities are for Congress and whether the agency’s funding line will increase accordingly to allow for a successful implementation for its announced initiatives. Mr. Gerstenmaier specifically referenced the need for NASA to have a clear understanding of what the ultimate Fiscal Year 2018 budget for the agency will be. “From our standpoint in HEOMD, it’s real important that we get some solid understanding of what the budget is,” noted Mr. Gerstenmaier to the NAC. Regardless, the fact that NASA has announced an architecture and multi-flight plan for SLS as well as a staged approach for its goal of landing humans on Mars by the 2030s is a promising step for the agency and for the role SLS will play in human and robotic exploration initiatives over the next two decades.